Carrageenans are a family of hydrocolloids used to thicken, stabilize and gel solutions. They are vegetarian and particularly effective with proteins so they are commonly used with dairy products. There are three basic types: Iota Carrageenan, Kappa Carrageenan and Lambda Carrageenan. In the presence of calcium, Iota Carrageenan forms a soft gel and Kappa Carrageenan forms a stiff and brittle gel. But in the presence of potassium salts, Kappa Carrageenan forms very firm and elastic gels. Lambda Carrageenan will not form a gel, but can be used as a thickener. Carrageenan can be used to make frozen desserts, to stabilize ice creams, hot dairy foams, to make rich mouthfeel custards even with low fat content or eggs, to cover an ingredient with a gel coat or to make constructed cheese which results in a cheese with the texture of nicely melted cheese but with the flavor of dry aged cheese. Carrageenans are linear sulfated polysacharrides extracted from certain species of red algae (seaweed) of the Rodophyceae class. The concentration and composition of carrageenan found in seaweed varies by the species of plant. For example, some seaweeds may be heavy in both kappa and iota carrageenans, while others may only contain a small amount of lambda carrageenan. 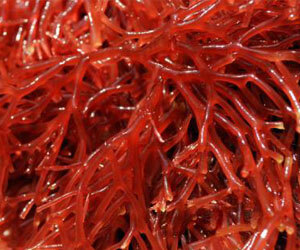 To extract carrageenan from the raw seaweed, the seaweed is harvested, dried, and processed. There are many types of Carrageenan beyond kappa, iota, and lambda, but we only use these three types in cooking. You may also see these ingredients referred to with their corresponding Greek lower-case letters: κ-Carrageenan (kappa), ι-Carrageenan (iota), λ-Carrageenan (lambda). The names of Carrageenans refers to the location along the long Carrageenan molecule where a particular branch of the molecule (in this case, an ester sulfate group) is connected. The location of this group affects the solubility and gel strength of the Carrageenan. Think of seaweed and how it can possess many different textures: it does this by mixing up its internal composition of Carrageenans. One of the most important properties that truly differentiates carrageenan from other hydrocolloids is its ability to complex or interact with proteins and is used extensively to thicken, gel or stabilize dairy based solutions. Carrageenan is not a surfactant, but it will stabilize existing emulsions. The 3-dimensional network which helps stabilize emulsions also functions to suspend particles. Iota Carrageenan is a great thickening and gelling agent mostly used with fruits and dairy to form a heat-reversible and flexible soft gel. Iota Carrageenan requires calcium ions to develop a gel and as all carrageenans, it is vegetarian and a great alternative to gelatin. Iota Carrageenan forms a soft gel, especially in the presence of calcium. Kappa Carrageenan gels as it reacts with calcium or potassium salts. In the presence of calcium, Kappa Carrageenan forms stiff and brittle gels. But in the presence of potassium salts, Kappa Carrageenan forms very firm and elastic gels. Lambda Carrageenan will not form a gel, but can be used as a thickener. Readers native to the United States may notice that many heavy cream and yogurt products available in supermarkets use carrageenan as a thickener. All carrageenans show stabilizing properties in the presence of milk proteins. Iota Carrageenan is great to make frozen desserts, to stabilize ice creams and hot dairy foams such as our Gruyere Hot Foam (shown below with egg yolk croquettes) and to make rich mouthfeel custards even with low fat content or eggs. Kappa Carrageenan rapid setting allows you to cover an ingredient with a gel. Just dip it in the hot kappa carrageenan solution and as you remove it and cools down it will form a thin brittle gel coat around the ingredient. The solution needs to contain calcium or potassium for Kappa to gel. 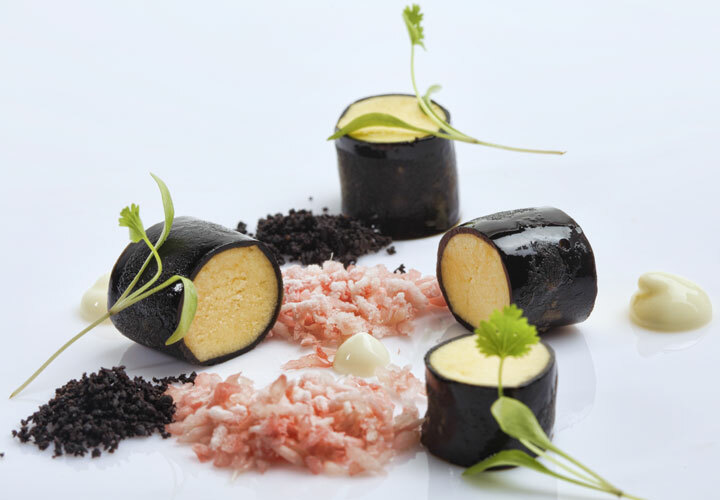 The "Liquorice All Sorts" recipe shows how to coat a sorbet with a liquorice gel as shown in the picture below. Iota and Kappa are frequently used together to adjust the resulting texture and mouthfeel. For example, a combination of Iota and Kappa can be used to make what is called a constructed cheese which results in a cheese with the texture of nicely melted cheese but with the flavor of dry aged cheese. Dry aged cheeses don't melt well and break into fat and chunks but carrageenans can stabilize the emulsion and solve the problem. 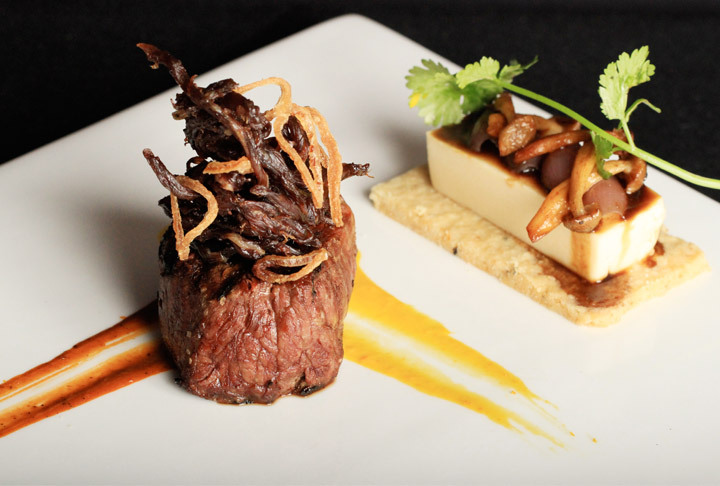 In the "Peruvian Inspired Filet Mignon with a Japanese Twist", we show how to make a smoked gouda custard using a combination of Iota and Kappa as shown in the picture below. Temperature (gels and melts): Carrageenan gels are thermo-reversible. Depending on the concentration of carrageenans used and the presence of cations, the gelling/melting temperature ranges between approximately 104°F/40°C and 158°F/70°C. Texture: Iota forms soft and elastic gel in conjunction with calcium salts, like calcium chloride, calcium lactate, and calcium lactate gluconate. In the presence of calcium, Kappa Carrageenan forms stiff and brittle gels. But in the presence of potassium salts, Kappa Carrageenan forms very firm and elastic gels. Combine the two to make small changes to texture. Appearance: Kappa Carrageenan gels are slightly turbid (cloudy). Iota Carrageenan gels are clear. Flavor release: Excellent, for a hard gel. Mouthfeel: Iota Carrageenan has been described as providing a "melt-in-your-mouth" sensation, while Kappa Carrageenan, depending on concentration, ranges from soft and brittle (tofu) to hard and brittle (cucumber) textures. Freeze / Thaw stable: Kappa is not stable, syneresis caused by freezing. Iota Carrageenan is stable. Syneresis (weeping): Kappa carrageenan does have syneresis, especially in low concentrations. Iota Carrageenan forms gels without syneresis. Shearing: Kappa Carrageenan forms shear-thinning gel, which means a Carrageenan gel can be blended into a fluid gel or extruded as a foam. Stirring a Iota Carrageenan preparation will prevent the forming of a gel, but if let to rest, the broken gel will form again. PH Tolerance: Between 4.0 and 10.0 pH. Poor acid stability. If possible, it is better to add any acidic ingredient in the preparation after the carrageenan has been dispersed and hydrated. Sugar Tolerance: Kappa Carrageenan does not hydrate well in the presence of sugar so it is better to add it after the kappa is completely hydrated. Ion Sensitive: Both Iota and Kappa Carrageenan form gels in the presence of Calcium. 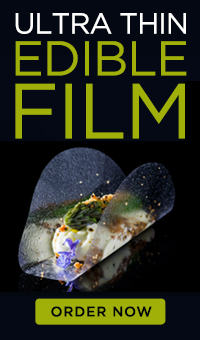 For Basic Spherification you can use calcium chloride but with Reverse Spherification you should use Calcium Lactate or Calcium Lactate Gluconate (preferred) for optimal taste. Kappa Carrageenan also responds to potassium in a similar way to form a gel. As the concentration of ions increases, dispersion improves, temperature at which carrageenan dissolves increases, gelling and remelt temperature increases. Synergies: Interacts with various other hydrocolloids to create new textures. Especially sensitive to milk proteins; thickens more readily in their presence. Kappa Carrageenan combined with locust bean gum (try with 60% the weight of Kappa) or Konjac Flour strengthens the gel and makes it less elastic. Iota carrageenan increases the viscosity of starch systems by as much as 10 times the viscosity of the starch alone, allowing the use of less starch to improve texture and flavor release. Concentration Range: Iota Carrageenan thickens at 0.02%-1% concentrations and gels from 1%-1.5%. Kappa Carrageenan thickens from 0.02%-1.5% and gels above 1.5% concentration. To make an eggless custard or flan, use 0.2% Iota with 0.15% Kappa. For a cold terrine, use 0.25% of Iota with 0.25% of Kappa. If you want a firm and brittle jelly, combine 0.2% Kappa with 0.4% Locust Bean Gum. To coat food with a firm gel, combine 0.45% of Iota with 0.35% of Kappa. To thicken a cold dairy sauce, use 0.1% of Iota. To make a thicker cold fluid with the consistency of pudding, use 0.2% of Kappa with 0.35% Iota. Keep in mind that these concentrations are just for reference and results will vary depending the calcium or potassium (for Kappa) content. Dispersion: Both Iota and Kappa Carrageenan can be dispersed in cold water with the help of a blender. To facilitate dispersion you can premix the carrageenan with other dry powder ingredients in the recipe or 3 parts of sugar by weight. Hydration: Iota and Kappa Carrageenan need to be heated to over 79 °C (175 °F) to hydrate and they gel as they cool. Lambda Carrageenan dissolves readily in cold liquids. To use Lambda Carrageenan, simply add the powder to the desired liquid and stir or blend to thicken. Setting: Once dispersed, the carrageenan solution needs to be heated to about 79°C / 175°F to be completely hydrated and as it cools down below 45°C /113°F, it starts to gel. Increasing the amount of calcium or potassium available will make the gel stronger and allow gels at higher setting temperatures and lower concentrations. Stirring a Iota Carrageenan preparation will prevent the forming of a gel, but if let to rest, the broken gel will form again. If you've been following along, you'll notice that Carrageenan resembles sodium alginate in that it gels in the presence of specific ions (calcium and potassium). That means it's indeed possible to use both Iota and Kappa Carrageenan for reverse spherification. Use these ingredients at a concentration of 1.5% and a corresponding bath containing either calcium lactate or potassium phosphate at 5% concentration. Carrageenan is a high molecular weight polysaccharide made up of repeating galactose units and 3,6 anhydrogalactose (3,6-AG), both sulfated and nonsulfated. The units are joined by alternating alpha 1-3 and beta 1-4 glycosidic linkages. The primary differences which influence the properties of kappa, iota and lambda carrageenan are the number and position of the ester sulfate groups on the repeating galactose units. Higher levels of ester sulfate lower the solubility temperature of the carrageenan and produce lower strength gels, or contribute to gel inhibition (lambda carrageenan). Upon cooling and in the presence of appropriate cations, kappa and iota carrageenan polymers align themselves to form individual helices. These helices can further associate with divalent cations that are present, e.g. calcium, to form a gel matrix. When Iota Carrageenan gels, the divalent calcium ions help form bonds between the carrageenan molecules to form helices. The 2-sulfate group on the outside of the iota carrageenan molecule does not allow the helices to aggregate to the same extent as kappa carrageenan, but form additional bonds through calcium interactions. The gels are more elastic, dry and provide excellent freeze/thaw stability. One of the most important properties that truly differentiates carrageenan from other hydrocolloids is its ability to complex or interact with proteins. In milk protein systems, at peripheral locations on the casein micelle there is a concentration of positive charges. This positive electrostatic charge attracts the negatively-charged sulfate groups of the carrageenan molecule to form linkages among the dispersed casein micelles. This reaction, in combination with the normal water gelling capabilities of carrageenan, can increase the gel strength about 10-fold.